Sweet Ella Valentine is a free crochet pattern designed for toddlers and children. This hat has been tested on a 2 year old and a 6 year old- fitting both of them perfectly. Tip: When using the Yarn Bee Cameo Bulky- Rosestone ( #6 Super Bulky) It may be hard to see the stitches. This is when you will need to trust your fingers to find the stitches for you. Round 2: CH 1, 2 HDC into same stitch, 2 HDC into each stitch around. Round 5-11: CH 1, HDC into same stitch and into each stitch around. around the edge of the hat. poms after cutting the loops and shaping them. 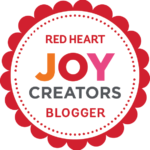 I used planetjune’s free crochet heart pattern to make the two small and one medium size heart. Attached them with a yarn needle. You will need one complete skein/ball of Yarn Bee Cameo Bulky- Rosestone ( #6 Super Bulky) from Hobby Lobby and just a small amount of the other yarn that is medium weight. I love this pattern! Very cute! I featured it as the free pattern on my blog today! 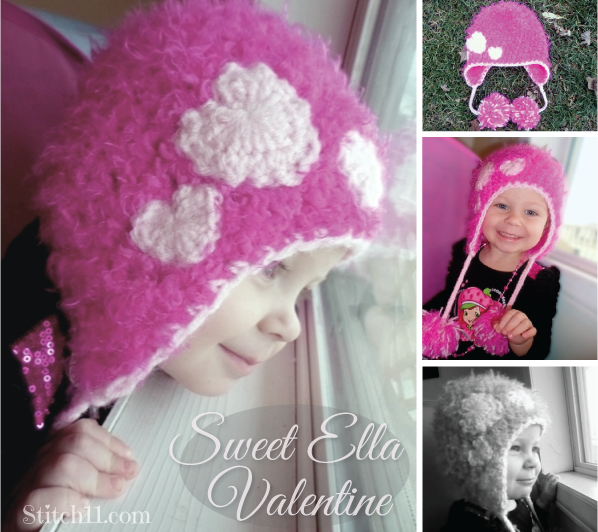 Do you have a pattern for the hearts attached to the Sweet Ella Valentine hat??? My daughters name is Ella and she loves anything with her name in it, even if it is just the title. She will get one next winter for sure!